Willamette Week Give!Guide is live! Donate today to Shadow through the Give!Guide and your gift of $50+ will be matched by Vibrant Village Foundation. Check out our incentives on Facebook! Portland Public Schools: Shadow is closing achievement gap! Shadow a "Top Rated Nonprofit"
We were touched to read about our impact through your reviews on GreatNonprofits. Special education teacher Chris Marquardt wrote Shadow has helped turn "non-readers into recreational readers." Keep your stories coming in! Come shop for books with Shadow on December 4th. Email Shadow@shadow-project.org for details. PSU Football Players to Shadow Kids: "There's so much more to you!" 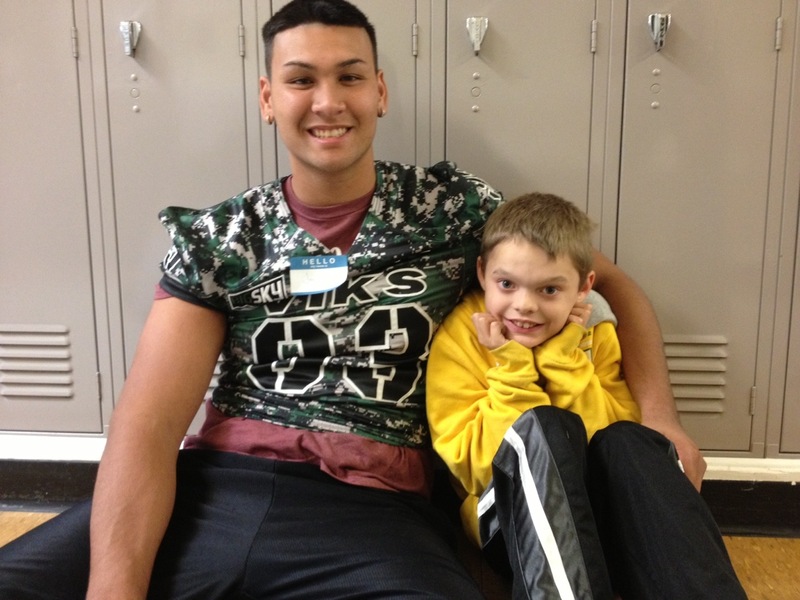 Portland State University football players teamed up with Marysville school students to tackle learning disabilities. Some 23 players, several of whom have ADHD and dyslexia, shared their school struggles and their stories about not giving up and facing obstacles. Vincent Johnson told the kids he was in special education starting in kindergarten. "I didn't like school. I didn't think of myself as anybody. I didn't have any friends." Vincent said kids who learn differently can use their unique perspective to find their own strengths. "There's so much more to you," he said. Marysville teacher Janice Holstine said witnessing the sharing between her students and the Vikings "took my breath away". "We have players of our own who have struggled with learning disabilities and become excellent student athletes and very positive role models. By working with groups like The Shadow Project we can light a fire for students who have struggled with similar obstacles." Shadow Joins Citywide READ BIG Campaign! We have been working closely with Portland Public Schools and a handful of nonprofit community partners on a collaborative pilot project that will provide intensive early literacy services at 5 PPS schools beginning January 2014. 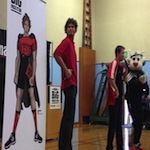 This effort is part of the larger city-wide READ BIG campaign, which was kicked off by Portland Trailblazer Robin Lopez and sponsored by the Blazers and Knowledge Universe. The goal: have every child reading to learn by 3rd grade (a strong indicator for high school graduation). A big THANK YOU to the dozens of volunteers who lent a helping hand to The Shadow Project during the Junior League of Portland CAREs event. 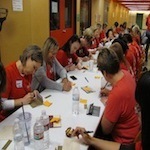 Together we assembled hundreds of family reading kits, school-supply goody bags and goal-setting kits for the special education students we serve and explored the topic of learning disabilities through interactive activities. A special shout-out to Regina Wheeler, a former JLP CAREs volunteer, who donated her time and expertise to help The Shadow Project launch a program evaluation this year. The Shadow Story is Now a Children's Book! Third grader Alex has learning disabilities. When he tries to read, the letters wiggle and squirm. "S" slithers like a snake. "C" turns cartwheels across the page. "That's it," he decides. "I give up." 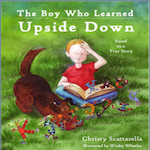 The Boy Who Learned Upside Down (Black Heron Press. 2013) is based on the true story of one child's journey from "I can't" to "I CAN!" that became the inspiration for The Shadow Project and celebrates the differences that make all of us unique. Proceeds from the newly released book benefit children in the program.